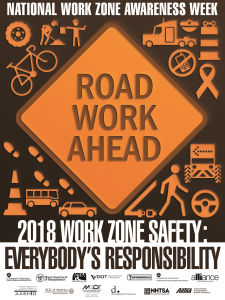 Alabama AGC, as part of the Alabama Struck By Alliance will participate in a National Safety Stand Down during the week of April 9-13, 2018 in recognition of National Work Zone Awareness Week and we are asking you to join us by hosting a safety stand down or safety meeting to make your employees aware of the importance of driving safely and un-distracted through work zones. “Work Zone Safety: Everybody’s Responsibility”. REMEMBER “WORK ZONE SAFETY IS EVERYBODY’S RESPONSIBILITY”.